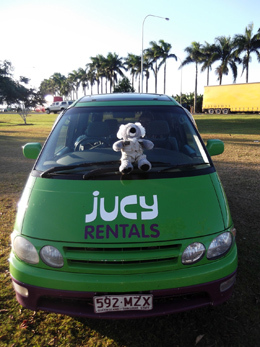 We picked up our Jucy camper van on Friday 3rd August, 2012 - it's basically a Toyota people carrier hollowed out in the back leaving two bench seats facing each other where the bed spreads across. During the day there's a table between the two seats with a DVD player over it. We've also got 2 good interior lights. All windows are covered by curtains which are stuck up with poppers so removable during the day. Open up the boot and you'll find a fridge, sink with pump action tap, and a gas stove. The whole thing is a little cosy, but it's perfect for the two of us. The way to deal with it is to be organised...put things back where they came from. Every evening when we stop we pull our suitcase and bits and pieces out the back and put them in the front seats - later on after I've lost enough card games and dinner is done and cleared the table is put away and the bed unfolded. In the morning we pack the bed away, shift everything back from the front seats and drive away... routine is everything. After collecting our camper we gave ourselves a fairly easy drive leaving for a small sea side town called Noosa. It was a great place to start and set the tone for the rest of our trip - rock up, have something to eat, move on. We then went on to our first camp site. We're helping the budget by using the multitude of free stops that can be found along the highway. They're called rest areas, and they usually consist of a small grassy area a couple of benches, and some toilets. The odd one has a cold water shower, and even rarer ones have warm water showers. We headed off to Rainbow Beach in the morning, and it was fantastic. 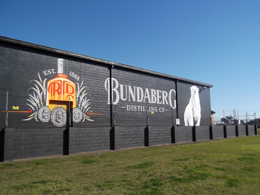 Our next stop was Bundaberg with the aim of touring the Bundaberg Rum factory. The tour of the Rum factory was great, the tour guides were enthusiastic and engaging, which is pretty good for a Sunday morning. However tasting session at the end was blighted slightly by the fact one of us would have to drive onward. A few kilometres onward from Bundaberg was Mon Repos Beach. The Beach was another stunner and we were lucky to see it as it usually spends 3/4 of the year closed to preserve the turtles that lay their eggs there. Onward to our next evening stop at Boyne River, we stopped at a few beaches along the way. We drove on to Rockhampton then made our way to Emu Park, which was another pretty beach. We decided to drive onward up the coast towards Yepoon - We followed a scenic highway north, which is something I recommend, when the Australians call something scenic they mean it. The next day we drove on up the highway to Mackay and after some lunch headed for a free camp site we'd heard about next to a secluded beach. Unfortunately it was packed out and our plans for the rest of the day (and somewhere to stay) were blown out of the water. As the sun was setting we decided to drive straight for Airlie Beach. We called ahead and booked ourselves into Nomads, a backpacker's hostel come camp site: it was the best thing we could have done. They were more or less on the beach, but managed to have a huge amount of space... and clean facilities including a hot shower. By now we're getting quite used to driving in Australia - it's really not too difficult especially when you're out on these highways. The views from the road are always fantastic - mountains, sea, huge fields of crops. I think now I've seen more dead Kangaroos in my lifetime than living. It's strange seeing a creature you pay to see in a zoo just laying dead beside the road. We decided to book ourselves onto a day cruise of the Whitsunday Islands. Our boat anchored just off Whitsunday Island where we were left on a beach which was just absolutely stunning - white sand, clear, blue ocean. The brochures aren't lying, these places exist. It was then time for our snorkel. What really made the trip was the nearby pod of hump back whales, underwater you can actually hear them talking to each other. The next day we were back on the road heading to Bowen. 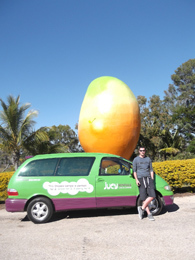 On the way into town is the Big Mango and we stopped and had a look. We then followed the routes we'd been given at the Tourist Centre, taking a look out over the town from a few of the vantage points, went paddling in Horseshoe bay - but my favourite was Kings Beach. We continued up the Bruce highway to Townsville one of the larger towns up this way. We visited Magnetic Island the next day, which is my new favourite place in the world. It was basically a day spent skipping between a multitude of different beauty spots. I must admit beauty spots by this time have become the norm, and kind of fade into each other, Australia has them everywhere. But Magnetic Island is on a different scale. We continued up the Bruce Highway up to Mission Beach where the beach stretches for miles and is lined with palm trees and dropped coconuts. We then went onward up toward a beauty spot called Paronella Park. The buildings here are beautiful against the back drop of the waterfall and the over grown rainforest. My top tip - always say it's too expensive, because you never know when you might be in ear shot of the owner. CAIRNS! We've finally arrived in the destination city of our road trip. We've booked ourselves into a Backpacker's hostel which offers discount rates if you park your Jucy camper in it's car park. Cairns it's actually a nice City - It's beach front doesn't actually exist, it's just marshy mud flats. They have instead a man made lagoon which is basically a misshapen swimming pool with a fake beach. It's all very pretty! We wanted to explore the Great Barrier Reef so settled on Green Island. The idea is you jump off the main boat on the island and are give a few hours to take up the activities available. We went on the glass bottom boat - we were taken out for around 45 minutes and saw much more than you could hope for in their snorkelling area. Turtles came to the boat, we were followed by schools of huge fish with exotic names and colours including a little clown fish. The coral here was more varied and exciting than we'd seen previously. 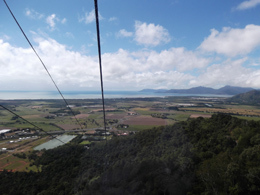 The next day we took a ride on the Sky Rail: a 7.5 Km cable car ride over unspoiled rainforest. Eventually it arrives in a small tourist town called Kuranda, it's full of tourist and spiritual shops very similar to that we saw on Tamborine mountain, though much more charming. The following day we drove an hour north towards Port Douglas. The drive turned out to be an event in itself as it follows the coast tightly and provides amazing views along the way. 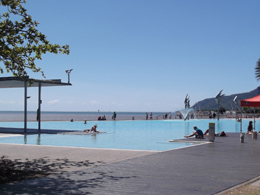 Port Douglas is a pretty seaside town and is right near the stunning 4 Mile Beach. We drove on up to Mossman to see Mossman gorge, which was very much worth the trip. We now had to begin heading south back towards Brisbane, but not before we'd taken a quick detor through the Atherton Tablelands. A feature of the Tablelands are it's numerous waterfalls - more that you could want to drive to in one day - we did 2 of them. 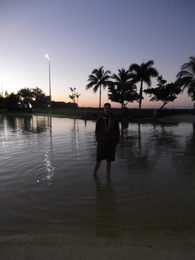 We stayed the night in Innisfail then headed south back down to Airlie Beach. After 2 more nights here, we continued our drive South - we aimed for a rest stop we'd previously used at Boyne River, just outside of Gladstone. 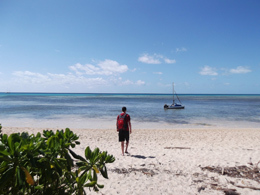 Our next destination was Noosa Heads, which was to act as a springboard for Fraser Island. The island also has a number of fresh water lakes and they're all made up completely of rain water falling over millions of years creating under ground water tables which eventually could sustain perminant lakes on their surface. Here you really do get a sense of the age of the planet. We stopped at Lake Mackenzie for a swim and a BBQ and were back in Noosa at 6 pm - an absolute must do. For our last day on the road we headed for Brisbane via Australia Zoo. The zoo itself is just amazing. The animals look happy in their large, lush, and interesting habitats. After 21 days, 4565 kilometres (2836.5 miles), around 560 litres of petrol, and 1006 photos, we're finally back. Time to use a clean toilet, have a long hot shower and start on the pile of dirty washing.